Home Apps Create And Manage Check Lists On Windows 8: Check List! 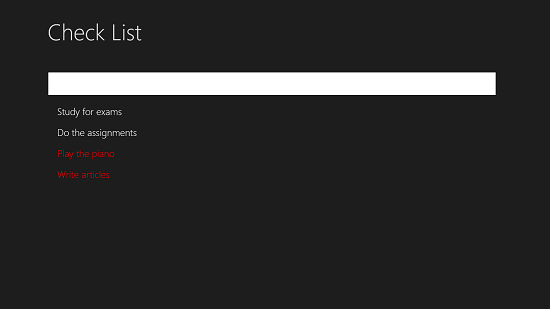 Create And Manage Check Lists On Windows 8: Check List! Check List! is a free app for Windows 8 and 8.1 which allows you to easily create and manage check lists on your Windows 8 device. The app when run will present you with an interface allowing you to easily create and make check lists which are extremely interactive in nature. When you open the app a text field box will be presented on your screen which allows you to enter the name of the check list item that you wish to add to the list and once you have added that by entering the name and pressing the enter key, you can mark it as completed or incomplete by simply clicking on that particular item in your check list. Check List! is available for free from the Windows App Store. When you install and run the app on your device, you will be shown the below interface. Adding items to your Check list is as simple as merely typing inside the text box field, and then pressing the Enter button. When you do that you will be presented with the item inside of your check list. The screenshot below displays many items which I have added to my to do list. To mark the items as completed, simply click on the items (left click) or tap on them on a touch enabled device. The item will then turn red meaning that you have successfully marked that particular item as complete. The best part about this app is that once you mark the items as completed you can go ahead and and unmark them as well. This is especially handy when you have mistakenly marked something as complete and want to unmark it. 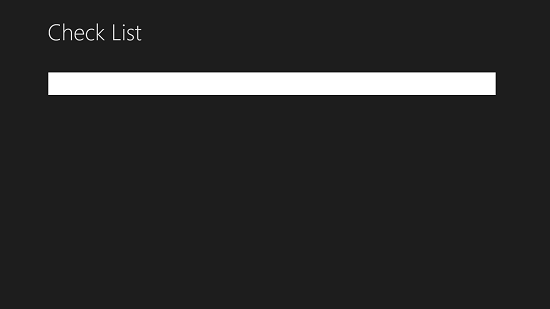 To remove an item from the list, simply press and hold. It’s that intuitive! Check List! is an extremely intuitive app for Windows 8 and 8.1 which allows you to manage tasks on your device. You can go ahead and grab it for your device from the link below.